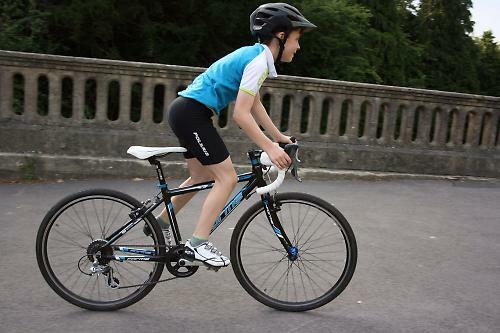 Forme, the in house bike brand of distributor Moore Large, makes kids' bikes under the name Formeula. 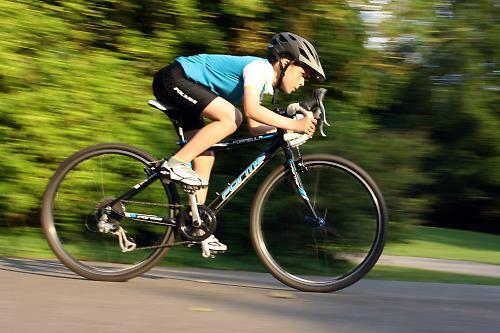 Their kids' brand provides the same 'no-messing' approach as the grown up bikes, giving junior riders the features they need without extraneous bells and whistles. The Formeula 24 is in many respects very similar to the Scott Speedster Jnr 24 we tested at the same time. The key difference between the Scott and the Formeula is the latter has been designed to run off-road, as well as on. It can be a road racer, or it can be a cyclo crosser. 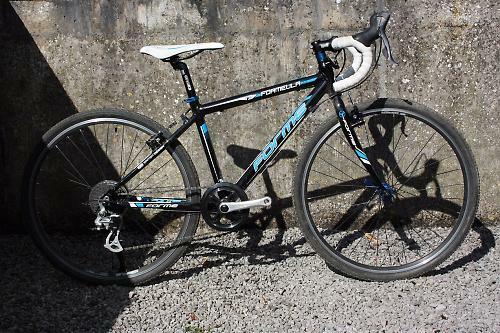 Forme recognise this and supply the bike with fat treaded cyclocross tyres fitted, but with a set of skinny road slicks in the box as standard. Brilliant idea and really sets up the bike to be a partner for any cycling adventure. The 14.5in frame on the Forme is a beautiful 6061 alloy number, with the sort of attention to detail and clean welds that wouldn't look out of place on a bike costing four times as much. Given its potential for double duty as a cyclo-crosser, the rear end has a little more space for wider rubber than the road-only Scott, though it's patently still a road bike, rather than a mountain bike with skinny tyres. 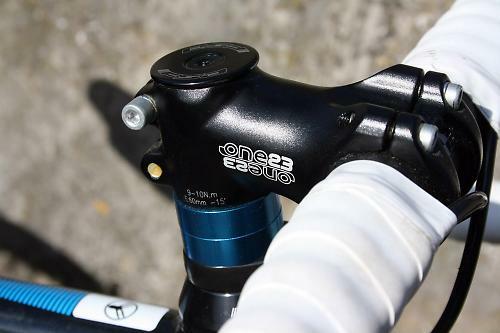 Frame and colour matched chromoly fork are equipped with neat canti braze-ons further cementing the rig's dirt remit. Guides are slotted, as you'd expect for easy cable care, again handy given the often less than attentive service attitudes of the average child. 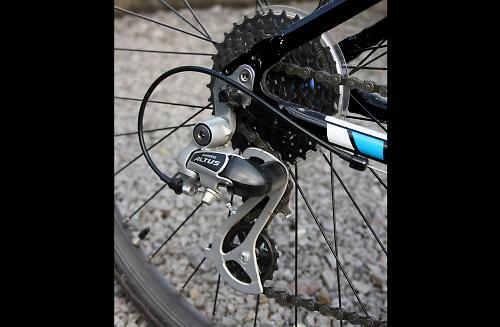 The transmission is basic Shimano Altus rear mech, though completely serviceable and accurate, it'll do rightly until it wears out in a couple of years. Forme fit the Formeula up with what they describe as their 1-2-3 fit system, essentially junior sizing everything that matters for smaller bodies. It's not anything the other bikes we tested don't also do, nevertheless it's good to see such care and attention in an industry which has a habit of characterising kids' bikes as 'toys with wheels'. Chapeau to Forme for taking kids seriously. The theory falls down in the places where all these bikes for real riding kids come up short: they are a bit over-geared. Mostly the problem's too many teeth on chainwheels. The Formeula has a single 36t front ring, which is cool in its no-messing simplicity, but a bit tall for the 11-32 rear cassette. 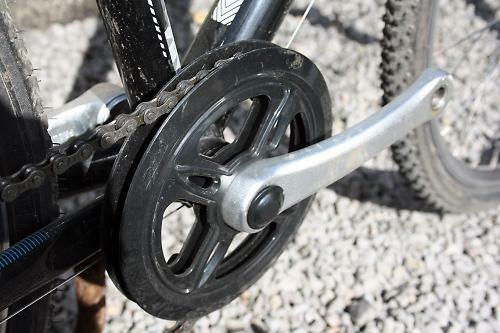 Little legs and 'fast-burn' energy levels need nearer a 1:1 ratio as a bail gear; we'd prefer to see a 34t ring or a cassette with a 36 top sprocket. With only one front ring, there is no STI front gear lever to fiddle with for the left hand. The look of the mismatched levers is a bit odd for adults used to matched levers, but it seems this is invisible to the average ten year old, as none of ours mentioned it. On undulating road and trails the Formeula rolls with ease, the 140mm cranks delivering just enough torque without killing their budding spin skills. The alloy wheels are tight and burly and run on sealed smooth running hubs. Perfect for using and abusing, without having to worry. The position is perfect for getting into a suitably aero tuck, while still giving control on steep off-road downhill pitches. Braking was good, though it did take a while for the brakes to bed in. Might've been the machined rim walls, or a hard pad compound, we're not sure. With no cross-top secondary brake levers, there was a moment or two, on early rides, when small hands were tested. 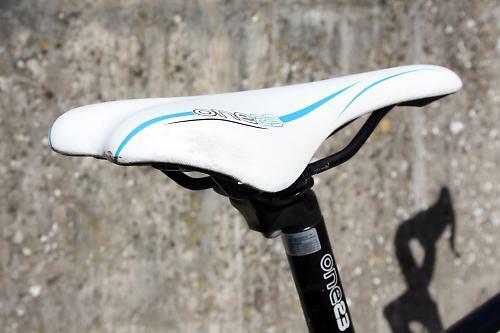 Notwithstanding the small details we'd like to iron out, It's a natural feeling bike that our testers all liked from the first turn of the pedals. Even as kids, liking something as tangible as a bike isn't a given. 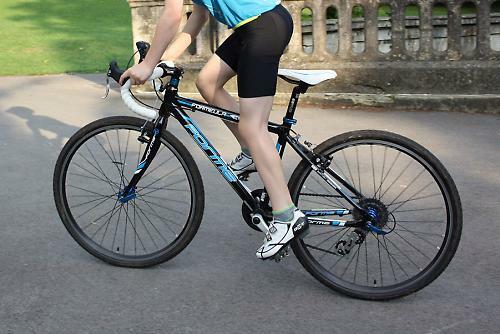 For example, not all appreciated the outright roadie feel of the Scott in the same way. The Formeula is a felt-tip pen ready to write on anything without thought; the Scott is a Mont Blanc fountain pen: it needs some fine, smooth parchment and concentration for best effect. The cost of the bike might seem high compared to brighter painted cheaper offerings from supermarkets etc, but make no mistake this is a worthy investment, as are all the upscale kids' bikes we tested. You'll be able to sell these on with ease and make back much more of your money. What with the extra tyres as well, we wish we were still at junior school. The Formeula is aimed at youngsters who want to get into proper road riding but also have a crack at Cyclocross. It performs as it was intended to with flying colours. The build quality was very good. clean welds, everything where it should be. Not as light as some on test but lighter than others. Not too sharp, ideal for those learning the ropes. About perfect. Right in the middle of the range we had on test. The bike could be ridden in a pack without worrying about it twitching into another wheel, yet chucked about on dirt corners if you felt like it. The single ring and wide spread of gears was useful. All components were sufficiently stiff. The light wheels and fast tyres helped make the bike feel quick. Once you got it going it was good for sprinting. Good stability on and off road. Takes slow grass CX style turns with ease. Good, only its weight stopped it from really being whipped in corners. Could do with a lower bail out gear. Ultimately it's specced to a price and budget kit does get sloppy quicker, though everything was fine through our test. Cranks could be a bit lighter. Everything worked well, only time and use and the odd spill would cause upgrade to be necessary. Two sets of tyres is a nice touch. The wheels are built tough over light. Good for learning. Good, but could be lighter. We tried lighter wheels in it and the ride did indeed improve. 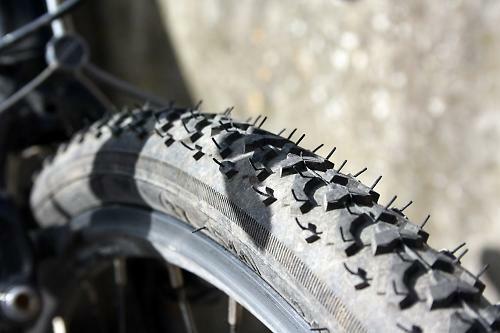 The Kenda tyres were very good. No flats and plenty of grip. Loads of grip and no flats. Left good skid marks. Can't ask for much more from a tyre. Pretty good considering the price and choices available. The brake reach and gear operation were still a reach for some smaller hands. Some of the riders struggled to make full gear lever swings as their fingers are just too short and not strong enough. Generally, everything components wise was good or better. A great all rounder, not as flat out racy as the Worx or the Scott, but a great place to learn the skills of a bike rider.